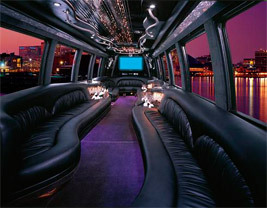 Limousine coaches are the perfect solution when a large party is traveling together. With the ability to seat 16-21 people comfortably, travelers can get up, stretch their legs and enjoy many amenities that come with our Limousine coaches. The Limousine coach has a power supply for our clients' convenience that can equip such things as laptop computers. From bachelorette nights to large scale business travel, the limousine coach allows everyone to travel in one vehicle in style and comfort. Limousine coach transportation services in and around Connecticut.